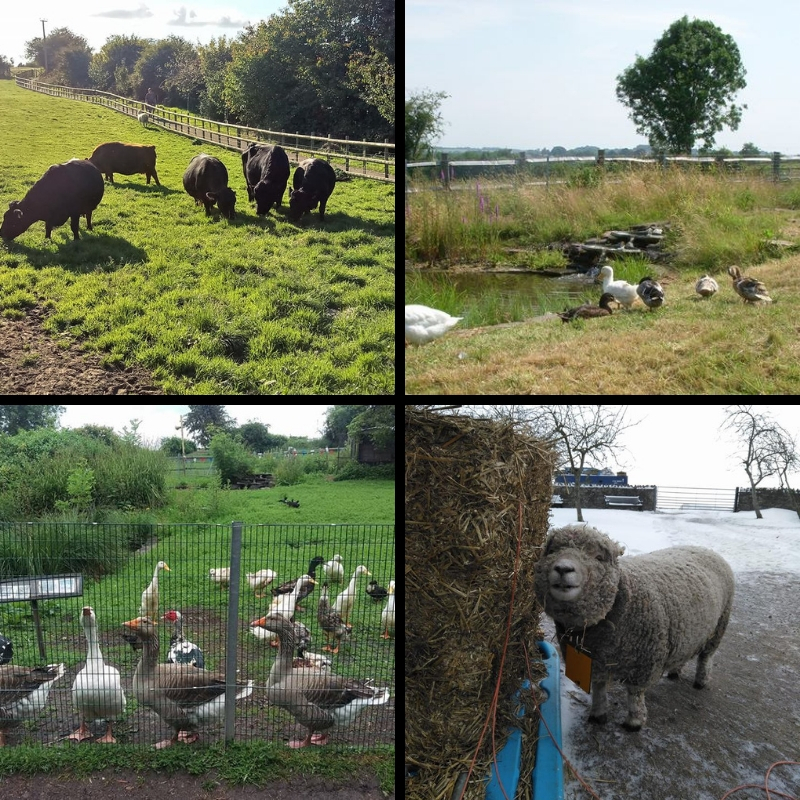 Grimsbury Community Farm is open to the public every day 365 days a year from 9am – 6pm, there is a car park on site and entry is free. Evidence of farming activities on this site have been found going back to medieval times, although ownership and detailed usage have changed many times over this period. Through marriages (involving the Stone and Tilly families in the mid-1700s) this site became part of the much larger Tilly estate which was in excess of 1000 acres. Following more changes in ownership, it was sold off in lots by the then owner, Rev. Edward Batchelor in 1862. The last private ownership was that of the Warner family who finally moved out in the 1970’s, whereupon Kingswood District Council took ownership. 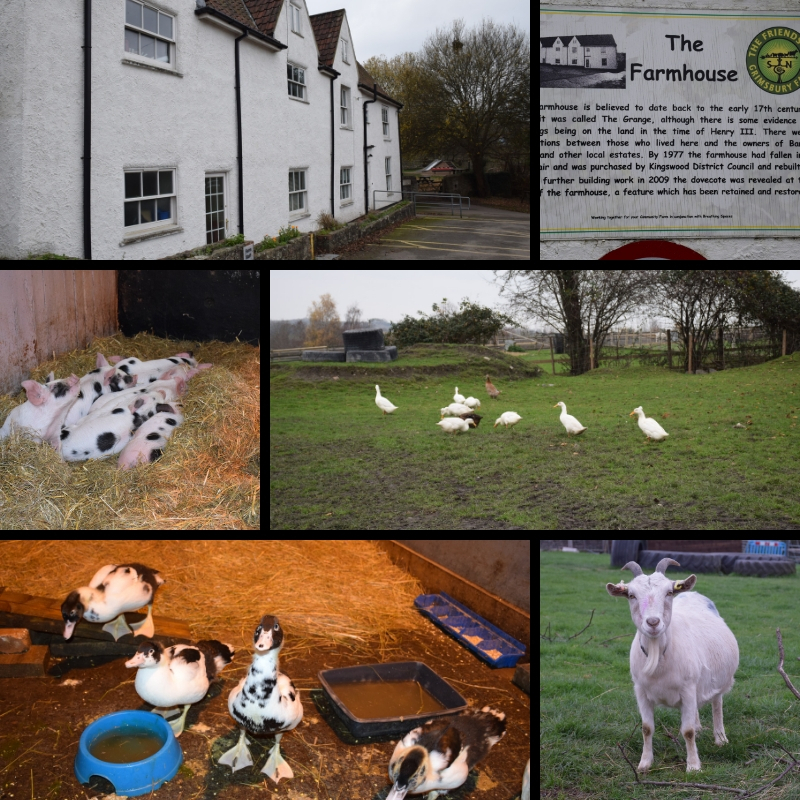 Today, the farm is owned and managed by South Gloucestershire Council, where its function is that of a community farm open to all as a place to relax and enjoy, or even to learn new skills. Throughout the year there are lots of different activity days and events including new births – lambs, calves, piglets, goat kids, ducklings etc so always plenty to do or see. Spring – Lambing, Vaccinations and worming. Scanning cows to see if they are pregnant. Putting the animals out into the field to eat grass. Planting sprint crops. Summer – The sheep are sheared to keep them cool in the heat. This wool is sent to the market. Lambs are weighed. Harvesting of spring and winter planted crops. Bailing straw from left over crops to us as animals bedding at the farm. Autumn – Calving of Cows, sending lambs to market, moving some of the cows and sheep into the barns for the winter. Cultivating the land and sowing winter crops. Winter – Female sheep are scanned to see if they are pregnant and also wormed and vaccinated. Cows are mated for Autumn calving. Maintenance is carried out on all the buildings, machinery, hedges and fences. There is a lovely Café “The Barn Café” providing children’s meals, a range of light bites, sandwiches & rolls, pasties, a selection of homemade cakes and also has daily specials – all very reasonably priced and freshly prepared. The Café is open daily hours do vary but usually 10am – 3.30pm. Besides providing food for humans you can also purchase small packs of feed for the chickens & ducks, sheep & goats or pigs who you can feed on you way around the farm. A rather damp Sunday afternoon didn’t seem like the best of times to visit Grimsbury Community Farm but we had a pleasant surprise when we arrived, the Farm has plenty to see even on a rainy day there are fairly dry pathways around the farm from where you can see an array of animals including : Pygmy Goats, Sheep, Dexter Cattle, several different breeds of Pigs, chickens, ducks, Donkeys & ponies to name but a few. 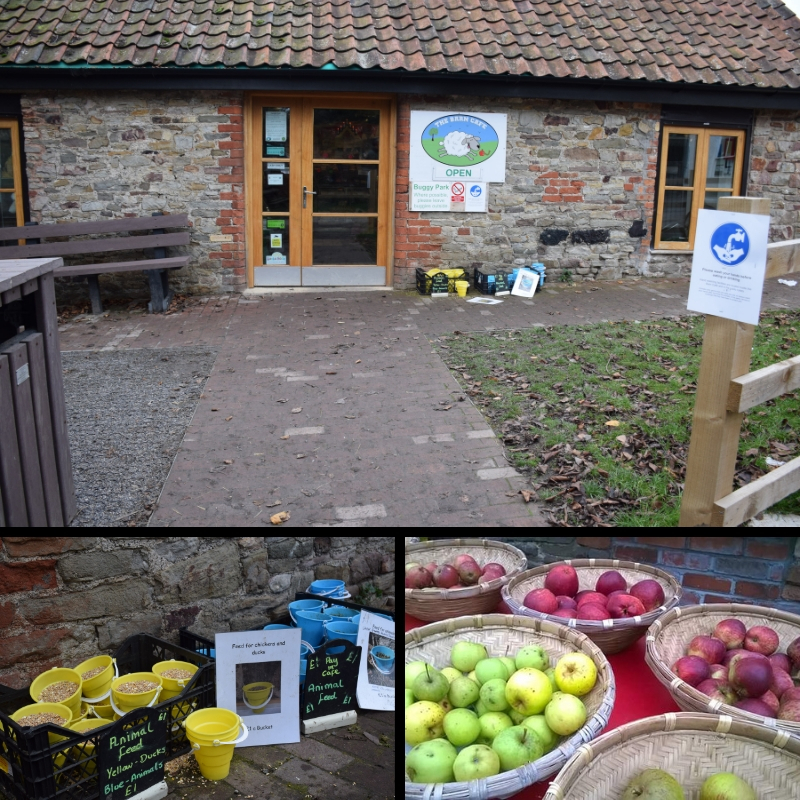 As you wander around the Farm there are lots of signage & information boards telling everything from the history of the farm to details of the breeds of animals and details of individual animals, which are both very interesting and educational. Upon arrival we decided to pop into the Barn Café (which is situated by the car park) for a nice cup of tea and a slice of lovely homemade Fruit Cake, we then had a wander along the pathway behind the café where you can see some of the ducks & chickens and then up to one of the barns which houses most of the Farm’s “babies”. In the barn was a Large Black Sow called Diana with her 11 piglets and 12 Gloucester Old Spot piglets – we read that the mother of these unfortunately died shortly after giving birth and it’s a testament to the care given by the staff at Grimsbury that all 12 piglets had survived hand reared ! Also in the barn were a Muscovy Duck and her ducklings, some lambs and a pen of rabbits. On the way out of the barn we stopped to pat a sheep that was hand reared & bottle fed and roams freely around the farm happily accepting pats & attention from visitors, we then walked on around a path between the fields, past the outdoor paddocks housing some of the pigs onto the Pigmy Goat’s paddock and there met a very inquisitive little Billy Goat who just loved attention & posing for photos. In the fields opposite were the Farm’s herd of Dexter Cattle (the UK’s smallest breed of cattle) some with calves too and some of the Farm’s sheep, some of these had red or blue markings on their behinds – which shows they have been served by the Ram and will be due to have lambs in the spring. 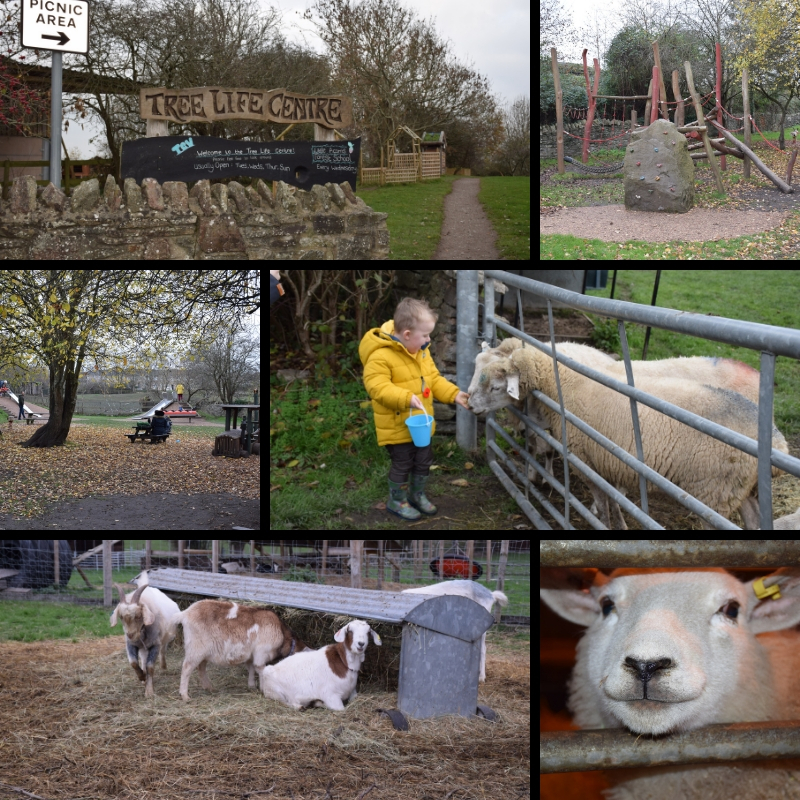 Further along there is the “Tree Life Centre” and Picnic Area and we then passed another field of sheep where some children were feeding some of the sheep who were very happy to nibble the food from the children’s hands. On our way back to the car park we also passed the large Children’s play area which has plenty to keep the kids entertained including, seesaws, sliders, swings, climbing frames & mini adventure playground etc and plenty of benches around for weary parents to sit too. So although it would be obviously more appealing to visit in the spring or summer there is still plenty to do & see even on a dull winters day at Grimsbury Farm ! Hello my name is Clare, I'm married with 3 children. We live on the farm. The Holiday Accommodation is part of an 8 acre small holding, which we've been renting out since 2009. We have chickens and a small number of pedigree Cows. The Holiday Home is completely separate from the Farm Area and has it's own parking spaces for at least 6 vehicles. We have had many guests and really enjoy sharing our local knowledge with them, if there's anything you need to know, just ask.